This taxon likewise comprises a single species, Foro panarium Olson, 1992, which is based on a complete and well-preserved skeleton from the early Eocene Green River Formation (Olson 1992b). F. panarium was about the size of a medium-sized pha-sianid, had rather short wings, and long legs. As shown by Olson (1992b), the skull is similar to that of Opisthocomus Hoatzin in its overall proportions, but differs, among others, in the shape of the beak, the much larger nostrils, and the deeper mandibular rami. As in the Hoatzin, the mandible exhibits retroarticular processes. 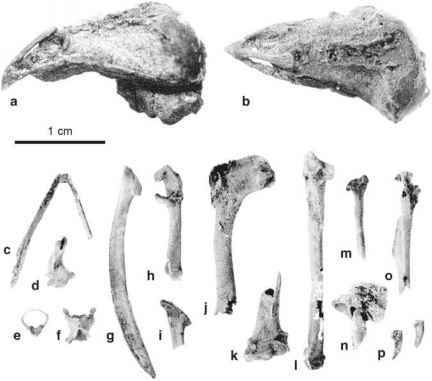 F. panarium is, however, distinguished from extant Opisthocomiformes in most aspects of its postcranial skeleton, such as the absence of a notarium, the much longer legs, and the morphology of the sternum and pectoral girdle. The pelvis exhibits distinct praeacetabular tubercles, which among extant neognathous birds are equally well developed in the Galliformes, Musophagiformes, and some Cuculiformes only. Olson (1992b) considered Fpanarium to be most similar to extant Musophagiformes and Opisthocomiformes. However, its phylogenetic affinities were "refined mainly by the absence of derived characters" (Olson 1992b, p. 129), which is a problematic approach in the case of early Paleogene fossils, as it is to be expected that stem group representatives of extant taxa lack derived features of their modern relatives. The phylogenetic affinities of Foro are thus uncertain, and the well-preserved holotype would probably repay efforts of a detailed character analysis.